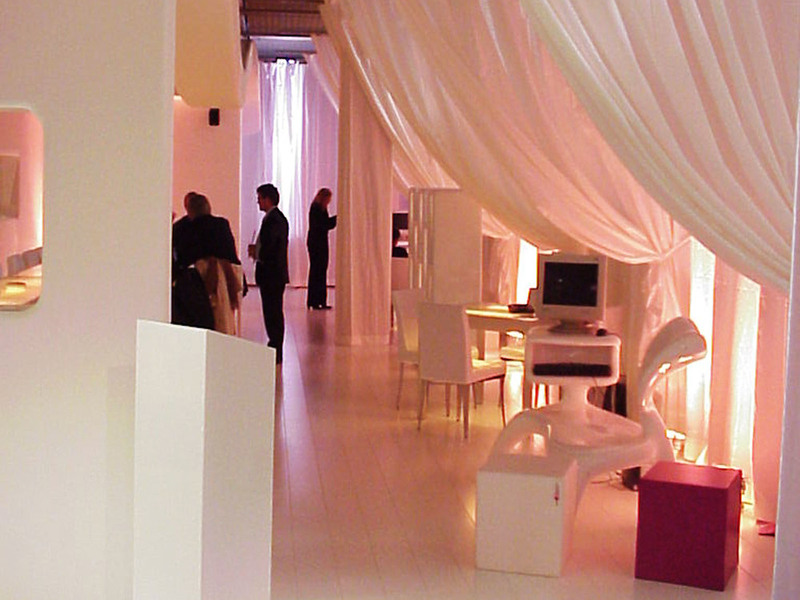 An intimate lounge built as an alternative to the over lit convention stands in enormous halls. A design conveying the modern, independent spirit of the Berlin-based Design Hotels hospitality company, and introducing the initial public offering of their sister company, Lebensart. Claus Sendlinger of Design Hotels, a Berlin-based hotel firm promoting boutique hotels featuring contemporary design, commissioned JMA to create exhibition spaces in 2000 and 2001 to present their new public company to the hospitality industry at the Berlin ITB Convention. 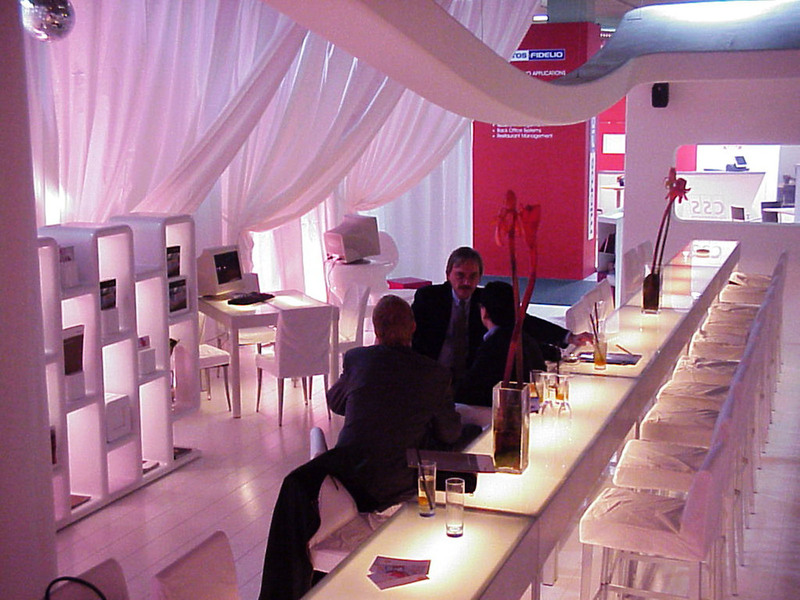 Typical ITB stands are frameworks for graphics, open to the convention hall. The Design Hotels stand was conceived instead as a modern club, an escape, allowing the Design Hotels team to tell their story in a setting consistent with the ethos of the extraordinary brand they curated. This exhibition was the second of three design projects for Claus Sendlinger, founder of Design Hotels. The tiny 120 square meter space won an award and was featured on television and on the cover of Ingrid Wenz-Gahler’s book “Big Ideas for Small Stands” book on exhibition design, and in wide range of articles in design and hospitality press. The design was created by translating hand sculpted foam maquettes into digital drawings which were emailed to a workshop in Frankfurt. There the steel armature for the exhibition was hand bent and shipped to Berlin where it was erected and plastered on site. Special furnishings were created for the exhibit. Graphics: Jordan Mozer & Associates, LTD.